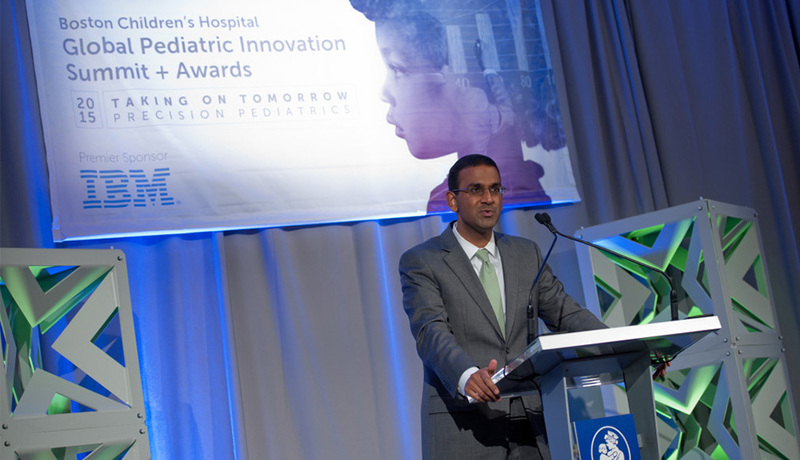 Before an audience of several hundred luncheon attendees, physician-scientist Vijay G. Sankaran, MD, PhD, received Boston Children’s Hospital’s 2015 Rising Star Award — recognizing the outstanding achievements of an up-and-coming innovator under the age of 45 in pediatric health care. Sankaran, a board-certified pediatric hematologist/oncologist with Dana-Farber/Boston Children’s Cancer and Blood Disorders Center, conducts innovative research on red blood cell disorders such as Diamond-Blackfan anemia, sickle cell disease and thalassemia. 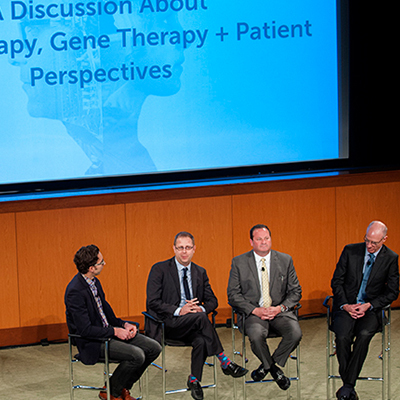 The Rising Star Award and companion Lifetime Impact Award ceremony were held at the hospital’s Global Pediatric Innovation Summit + Awards on November 10. Sankaran, who received his doctorate and medical degree from Harvard Medical School in 2009 and 2010, simultaneously pursued medical and postdoctoral research training at Boston Children’s Hospital, Boston Medical Center, the Whitehead Institute for Biomedical Research and the Broad Institute. In 2014, Sankaran established his laboratory at Dana-Farber/Boston Children’s and was appointed an assistant professor of pediatrics at Harvard Medical School. In an earlier interview, Sankaran shared the pivotal moment when his concentration turned to blood cell production and research, and how many pioneers influenced his research path. 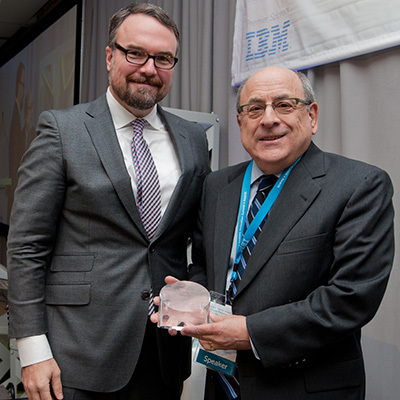 Sankaran’s mentor and 2015 Lifetime Impact Award recipient Stuart H. Orkin, MD, of Dana-Farber/Boston Children’s, says Sankaran is destined for innovative greatness. “[Vijay] has already established a vibrant laboratory that is using human genetics to provide clues to the defects and pathophysiology of hematologic disorders,” wrote Orkin in support of Sankaran’s nomination. “It is hard to conceive of another young pediatric investigator who has accomplished so much in such a short time and is poised to make truly innovative discoveries going forward. Sankaran’s accomplishments include establishing an ambitious platform of research focused on the genetics, genomics, cellular biology and physiology of red blood cell development and red blood cell disorders. Over a period of four years, Sankaran combined human genetics and whole genome mapping to identify the molecular switch BCL11A as a possible treatment target for sickle cell disease and thalassemia, diseases both related to hemoglobin mutations. His discoveries are fueling current efforts to affect the gene’s activity therapeutically using gene editing tools such as CRISPR. In addition, Sankaran’s molecular research on Diamond-Blackfan anemia (DBA), a severe, congenital form of anemia, has directly resulted in a unified model of DBA biology that integrates seemingly conflicting genetic discoveries about the condition into a comprehensive explanation of its biochemical underpinnings. Most recently, Sankaran’s laboratory found it could triple blood stem cells’ production of red blood cells by shutting off the gene SH2B3, a target identified by combing data from genome-wide association studies. The work, reported recently by TIME, could lead to better, cheaper methods of manufacturing red blood cells for transfusion and for use as drug delivery vehicles.